Wait for dessert no longer. 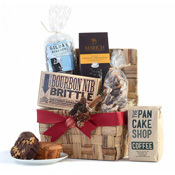 Chocolate lovers can satisfy their cravings at the morning meal with this cocoa-powered gift of chocolate-y treats. 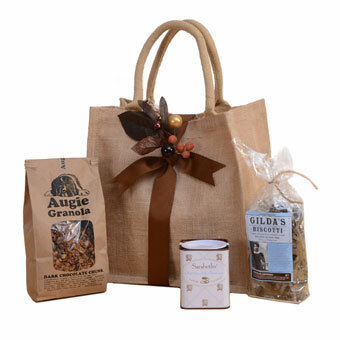 Tucked in to our handsome jute tote is Dark Chocolate Chunk Granola from Augie Treats. A granola with a cult-like following, it is a decadent blend of organic, gluten-free rolled oats, Tremezzio 70 percent dark chocolate, almonds, pistachios, dried fruits, olive oil, sea salt and maple syrup. If that's not enough to get you out of bed, we've added Chocolate Espresso biscotti from Gilda's Biscotti....a rich biscotti made to traditional Italian methods and combining extra-dark cocoa powder, bittersweet chocolate chips, and ground La Colombe espresso. And a chocolate aficionado hasn't lived until experiencing Sarabeth's Hot Chocolate Parisienne......arguably, the best cup of hot chocolate this side of Paris. A unique gift of chocolate, ideal for giving any time of year! 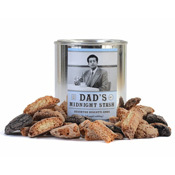 Augie Treats - Dark Chocolate Chunk Granola: Ideal for breakfast or any-time snacking, this chocolate-y treat is made with organic oats, nuts, fruits, and Tremezzio Bio 70% dark chocolate. Gilda's Biscotti - Chocolate Espresso Biscotti: Double baked for a crisp, Italian-style biscotti with rich, bittersweet chocolate flavor combined with La Colombe espresso. Sarabeth's - Hot Chocolate Parisienne: A thick, rich drinking chocolate, arguably the best cup of hot chocolate this side of Paris. Jute Tote Bag, 12" x 12" x 7 3/4"